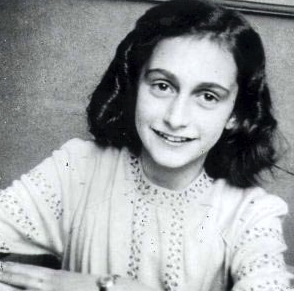 I was so determined, when I started the Diary of Anne Frank, to enjoy this girl and find out what she wanted us to know, as she sat in the secret annex writing and writing for years. I would not constantly think of her as doomed, not continually think of the Nazis who were coming to get her. I would appreciate her as herself -- a delightful young person struggling with growing up, and a wonderful writer. As I get to the end of the book, she is more and more articulate and exuberant--she loves life, loves the beauty of that small part of the world she can see from the annex attic. And she's closer and closer to being found and deported to the concentration camps. She's going to endure unimaginable suffering. I am thus now at the heartbreak, anger and disbelief stage. We'll be visiting Anne Frank House soon. Remembering is all we can do now. It's not doing a lot, but I do think that it's something very important. I was in Amsterdam a few weeks ago. I passed in front of the house and there was an incredibly long line, and it seemed very slow. Something like a 2hr wait. Amsterdam must be one of my favorite cities. Really beautiful if it's sunny. Thanks--I was worried about that, so actually got tickets online. Hopefully that will help, and the long line was for tickets, not entry. Looks really pretty in pictures. It's a long line pretty much no matter what. In fact that is how the tour works: you are in a line that moves through the space which makes it strange since it's such a tiny space, packed with a line. And yes. It's pretty much just horrible to contemplate. Ohhh, well, I'm glad I know that in advance. We'll plan accordingly. Thanks for the info. I had a short post about Anne Frank a couple of years ago. I regret I didn't get to visit where she stayed on my one trip to Amsterdam. One of those novels I mentioned, The Rembrandt Affair, has a fictional character kind of like her in it. best thing I did in amsterdam was renting a bike for the day and just aimlessly biking around the small roads in the center. It's nice and safe. If you stay away from the main touristic areas you can also eat for a decent budget. There was only one vegetarian option on the menu, but it was pretty good ... the van gogh museum is good, and not too crowded (I visited that 10 years ago, I don't know now). I'm determined to see a windmill and hear you can bicycle just a ways to see one--so that's on the list of things to do. You know what is cool? The tour of the mega damn system they have that protects their below sea level land. I don't remember if that's close to Amsterdam though. It all sort of blended together after my visit to the coffeehouse. What seems at first like a paradox: the Dutch are a liberal, outward-looking, cosmopolitan people, but very orderly and with a strong sense of their own identity. What they prize: "gezelligheid" -- coziness. Even their language reflects this, as they are prone to stick the diminutive "je" on the end of just about any noun. I think you've been and returned already at this point, but I'd like to leave one more pointer for those who are considering going to Amsterdam. Take one of the cheesy canal boats. Yes, it's a touristy thing to do but it's a great way to get another perspective of the city and its history. You'll see a lot of beauty from the water that's impossible to see from the roads. I say this as one who was born in Amsterdam. Oh no...we didn't do that, because it did look cheesy. Sounds like we should have. One thing I'm really glad we did--we rented bikes and rode by the Amstel about 6 miles outside the city. I'm going to put up some pictures soon.